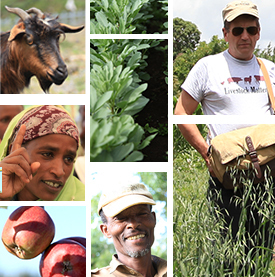 This is the story of Worknesh Gurmesa a farmer in Chelanko Kebele. I met her during our April 2013 field work to test the use of SLATE – a tool for Sustainable Livelihoods Asset Evaluation (more information). This training of trainers was jointly organised by Africa RISING and the Nile Basin Development Challenge. Participants were from the Africa RISING Ethiopia project sites and the NBDC Innovation Platforms. This story is told as its explains the importance of women’s inclusion and how access to markets affects as well as changes lives. She had her first child one year after she got married. Giving a 2-3 year gap between children, she gave birth to 6 children (3 sons and 3 daughters). She went back to her dream of education. She began again with her schooling from grade 8 in 2007 and completed grade 10 in 2009, though not as high-scoring a before. “It became difficult for me to study and raise children at the same time and I couldn’t go further”. Worknesh explains how lack of access to the market keeps her potatoes in storage (image credit: ILRI\Simret Yasabu). Her family earns a living from farming and dairying and Worknesh is an active farmer and household manager. She particularly involves herself during the planting and harvesting seasons: “I really like to plough, though I get tired afterwards”, she says. She supervises the people who are paid to farm their land, she makes sure what is harvested is properly collected and stored and she manages the finances. Today, the family is getting to be economically strong. It has 5 oxen, 2 cows, 4 horses,2 donkyes, 4 hens, 5 sheep, 2 lambs and large areas of farming as well as grazing land . They are now moving to a new house which has better access to facilities including electricity, water, mills and infrastructure like roads and the school. She strongly believes in women’s empowerment and economic strength. Towards this, she established three women associations, each with fifteen members. She is chairperson of one of them. The associations aim to improve the lives of their members through capacity building and market assessment. They also serve as problem-solving platforms and help members to develop self-confidence. The associations struggle as they are not able to get licenses to operate. Worknesh says “women are not always encouraged to move independently and that was why we found it very difficult to get the license for so long to move forward”. They need license to operate beyond their local areas. 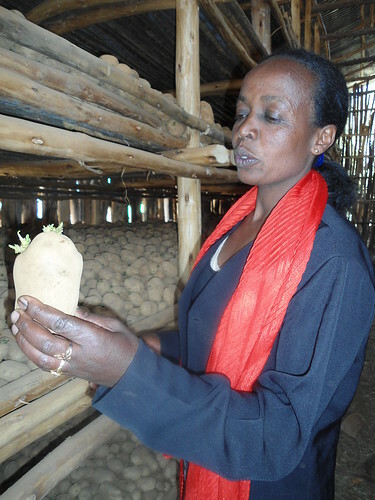 “If we are lucky to get someone to buy and take our potatoes to Addis Ababa, we sell them for between 500 and 800 birr (1 USD ~ 19 birr) per quintal. However, this is not the case most of the time and we are forced to sell our potatoes to the nearby market for only 100 – 200 birr per quintal”. Moreover she adds “there is much wastage as we are keeping the potatoes for a longer period when they are not sold”. This year, with a smile in her face, their voices were heard and their licenses are ready to be issued. When they get the license they will have the right to go beyond and sell their outputs with good price and on time. Tags: interview, portrait, slate. Bookmark the permalink.